Our country has become bitterly divided. No matter who won the election, I predicted we would soon be reading about states wanting to secede from the union. 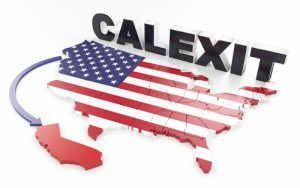 Even before President Trump was sworn in, the California movement, known as Calexit, began. The first step is to ask voters to adopt a state Constitutional Amendment revoking the U. S. Constitution as the supreme law. “As the sixth largest economy in the world, California is more economically powerful than France and has a population larger than Poland. Point by point, California compares and competes with countries, not just the 49 other states. Since 1987, California has been subsidizing the other states at a loss of tens and sometimes hundreds of billions of dollars in a single fiscal year. I’m unable to determine if the claim “hundreds of billions of dollars” is accurate. How is it calculated? Is a post office or military base returning money back to the state? Creditloan.com indicates California receives $.78 back for every $1.00 is sends to the federal government. Maybe they have a point. Our founding fathers felt the values of the King of England conflicted with the values of the colonies. Many Americans cheered the British on when they opted out of the European Union. For both situations, oppressive taxation, different values and cost and control of the central government was a motivating factor. “To understand how far short this move falls, consider that CalPERS announced Wednesday that it hadn’t hit a 7 percent average over the last 20 years and, going forward, it estimates that there’s only roughly a 1-in-4 chance that it will meet that target. … CalPERS consultant warns that the pension system should anticipate only an average 6.2 percent in each of the next 10 years. George Bernard Shaw said, “A government that robs Peter to pay Paul can always depend on the support of Paul.” In many cases Peter quietly moved away and took his money with him. We lived in Georgia when they passed a state income tax. While it’s progressive, the top rate (6%) kicks in at $7,000. At the time I was in my peak earning years and could live anywhere. I was an early immigrant. The first time I paid GA income tax, I realized our other taxes did not go down. What did I get back from the government for confiscating an additional 6% of my earnings? We quickly moved to Florida, with no state income taxes. 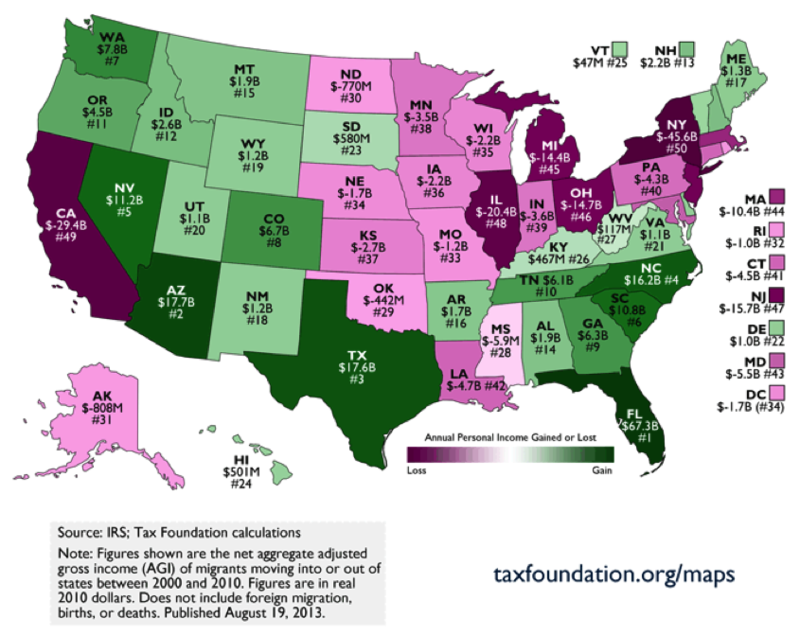 Florida is full of refugees fleeing other high tax states. The election of President Trump sent shock waves through much of the political class. Many public union pensions are woefully underfunded. They donated millions to Hillary Clinton’s election campaign and expected federal bailouts. They knew they could count on Mrs. Clinton; she has a great track record of rewarding her political donors. Today no one knows what the new administration will do. In the meantime, the scramble is on. The politicians in states that have been heavily supporting Paul have a huge base, not because they have won over the hearts and minds of Peter; but rather because the working class got tired of being fleeced and left. The politicos have to find ways to make good on all their free programs. Cutting benefits will cause citizens to storm the palace. They must find ways to generate more revenue. “To be clear, it is not legal for states to charge a true exit tax on citizens changing their residency from one state to another (this is not the case for the federal government, which does charge a large exit tax). When a taxpayer is audited, the agency issues an assessment for unpaid taxes. It’s not “innocent until proven guilty.” You must prove they are wrong or the assessment stands. Once you intend to leave you are of no value to the politicos. Most people do not have the means to go to court. For some, it becomes a government shakedown to extract as much wealth as they can on your way out the door. With the mindset of California voters, who knows what will happen? I don’t recommend holding any California government debt, including holdings in bond funds. While the probability of secession may be small, might they establish their own currency and try to renegotiate their debt? Holding California debt is an unnecessary risk to take with retirement money. Should they vote to secede, Californians would face a choice of leaving or staying. If you choose to leave, expect a hefty exit tax. If you are thinking about leaving, why wait? Walk quietly and beat the rush! Stan the Annuity Man publishes the Income Investor digital newsletter. Last week he published my article, “Is Social Security Still The Best Annuity On the Planet?” His newsletter is free and I highly recommend it. Last week I was in Daytona Beach. David Holland hosts a television show, “Plan $tronger” which airs on local channel WDSC (Channel 15) every Monday night at 7pm. We taped a couple of shows. If you are in the local area, please tune in. As I was herded on the plane I mentioned to a fellow traveler I used to travel so much, I was a platinum cardholder for every major airline. He remarked, “Once you retire, they quickly forget you.” Boy, that’s the truth. Not only do the free first class upgrades disappear, you are relegated to boarding group Z, the last to board while scrambling for storage space in an overhead bin. I was on the road 40+ weeks per year for more than three decades; regular business travelers earn those perks. I envision children with panicky looks on their faces looking at mom and dad who warn them to behave on the flight. This and the rest of that organization’s position statement is BS. Who has paid tens or hundreds of billions since 1987 for fires, floods, and earthquakes in California? The Federal government. Who will pay if the Oroville dam gives way and floods where tens of thousands live [or is it more…they eveacuated 188,000 at least temporaraily]? Who will pay for the NEXT eathquake disaster? Continuing the thought of the previous commentator: If California is continually paying more into the Federal government than it is receiving in benefits, then why do they keep electing socialists to run their state? The whole idea of socialism is to spend other people’s money; now they’re complaining when other people spend their money! Also, are their bean-counters including the money spent to locate military bases in their state in the “benefits received” column? Or the jobs associated with military spending that have occurred in their state over the years? From a political perspective, as one who doesn’t live in the land of fruits and nuts, I would prefer to see them go. It will mean a lot less for Republicans to worry about overcoming the constant blue wall of electoral votes every four years. I spent a bit of time trying to validate the claim about CA sending more to the federal government than it receives – and could not validate it. Off the top of my head, most every state should probably say the same thing. The federal government is like a lousy charity that siphons a lot off the top. The one part about their case that everyone seems to agree on is that Californians have much different core beliefs than the rest of the country. It appears a lot of folks like yourself would not be willing to risk their life to keep them as part of the union. Let’s hope it does not come to that. In the past I have written about the Russian scholar that predicted the US would break apart. His premise made sense but he lost a lot of credibility by saying it would happen during the Obama administration. The cultural divide and welfare mentality certainly clash with the working class and there seems to be little common ground. Both democrats and republicans have been ruling against the will of the majority for quite some time. It is becoming clearer by the day and it is a mess. To paraphrase a few analogies, when the swamp gets drained you see who’s swimming naked, and a lot of ugly stuff comes in to view. I have faith in the core values of mainstream America. We will survive, but it will be a rocky ride. Dennis: I too am interested in claims that states like CA pay way more in taxes than they get back in Federal spending. One complicating factor that I am not sure has been accounted for is entitlement taxes and spending for old people. Namely, Social Security and Medicare (but NOT Medicaid). This is a HUGE fraction of the Federal government’s spending: Social Security ~= 25% and Medicare ~= 15%? (The question mark for Medicare is that most sources always lump Medicare with Medicaid, and together they are ~25% of the Federal budget as well, but I want Medicare alone. I found a chart which shows that Medicare spending looks like it is ~2/3 of the total, so I guesstimated it as 15%. By all means please enlighten me if you have a better number). I do not think that it is fair for a state to claim that taxes paid to the Feds are not coming back to it as spending IF that state has policies that are driving its old people out during their retirement years. States with tax oppressive policies like CA, NY, IL, etc. Those ex-residents are taking their Federal benefits with them when they are practically forced to retire elsewhere. But that does not mean that CA is really subsidizing, say, AZ, because those current CA taxpayers will also likely flee CA upon retirement as well. To do an accurate comparison, you should attribute spending for old people to the state(s) where they earned their money during their working years, as opposed to the state they are currently retired in. I have long believed that once the welfare class can out vote the working class, the party is over. The welfare class can be those choosing not to work, plus those on social security or government pension, all depending on their government checks. When the cost to support those people becomes such a burden on the working class, if they can, they vote with their feet. Thousands of people flocked to the new world. People are moving within the states. High taxation has consequences and the politicians never take responsibility; they prefer to belittle the poor working class that are footing the bill. You can apply my concern to the state level, certainly look at Illinois. I wrote sometime back where 20% of Illinois pensions are sent to people out of state. At the same time, what happens when the entire country is in the situation where the welfare class owns the majority of the votes? Will it cause a break up of the union? If that should come to pass, it would be temporary in my opinion because the working class would move into one area leaving the remainder full of people who are unable or unwilling to support themselves. I sure hope it does not come to that because the welfare class will get hungry. It will not be pretty. If I come across any more data, I will gladly pass it along. Join today and receive my articles – Straight to your inbox for FREE! PLUS, when you join, you will receive my Special Report – 10 Easy Steps To The Ultimate Worry-Free Retirement Plan – Absolutely FREE! Straight shooting on retirement and finances...from someone who's actually been there. We are committed to providing FREE newsletters for our readers. Donations help offset our costs and are greatly appreciated. Our website is FREE and we want to keep it that way. In lieu of asking people to pay to subscribe, we look for alternative ways to raise revenue to offset our cost. Our affiliates are appropriate for our readers, we trust them. It’s a win/win for all. When you click on their image below, they offer Miller on The Money readers a special discount, and we receive a small stipend for our help. I urge all readers to check them out. Shopping at Amazon through this link is a win/win for everyone. Miller on The Money is a participant in the Amazon Associates Program, designed to provide a means for us to earn advertising fees by advertising and linking to Amazon.com. Whatever you purchase will still cost you the same amount of money; however Amazon will send us a small stipend because you ordered through this site. Jo and I use Amazon a lot. It is convenient and they offer great service and prices. Any purchases you wish to make through this link is greatly appreciated. Click on the ad above to shop at Amazon. © Dennis Miller and https://milleronthemoney.com. No content on this site can be reproduced without express written consent of Dennis Miller, https://milleronthemoney.com. Hi…Join us, and I’ll immediately email you my brand new Special Report – 10 Easy Steps To The Ultimate Worry-Free Retirement Plan – It’s yours FREE just for joining our community!